Written by Jim Hunt on May 19th, 2015 September 22nd, 2015 . 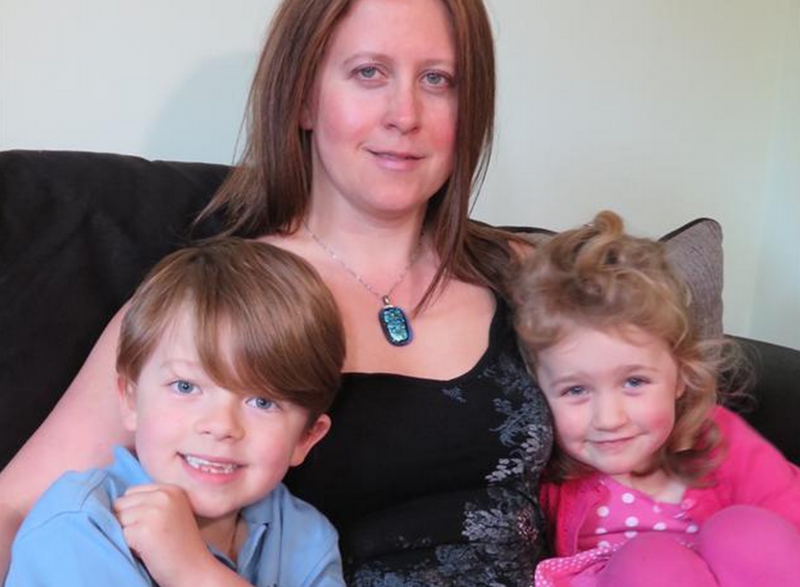 Jo Dunk, 40 from Canterbury, was diagnosed with MS as a new mum in 2009. Refusing to let the condition define her, she battled chronic tiredness – and risk of a relapse – to have a second baby in 2011. “Like many people living with MS, I was probably suffering from symptoms for years before I was diagnosed – but put them down to other things. First came the tingling down one side of my body in my early 30s, which I assumed was down to my long working hours. A career in retail is not for the faint-hearted – a combination of all-night stocktakes and standing on my feet all day meant my job was pretty gruelling. Then after my son, Ollie, was born in 2008, I was wiped out. One memory is of lying in bed sobbing uncontrollably with tiredness when my husband Ian went back to work after paternity leave. But knowing all new parents felt exhausted, I put it down to sleep deprivation. Then, I developed numbness in my legs. But because I’d had a Caesarian section when Ollie was born I blamed it on spinal block after effects. When Ollie was nine months old, I returned to work as planned – but just didn’t have enough energy so switched to a sedentary office job. After six or seven appointments in as many months with a neurologist, I finally received a diagnosis in 2009: relapsing and remitting MS. Ollie was a year old, and I was 34. It was almost a relief to know what was wrong. But of course it was also very frightening. I wondered if this was the end of my happy, active life. At that time, it almost felt like a bit of a death sentence. Looking after a toddler is tiring enough – let alone if you’ve just been diagnosed with MS. But with the support of Ian, my family and friends, we got through. Ian and I had always wanted two children, but the worry was that I’d have a relapse after another pregnancy. One of the clinchers was talking to a man whose sister had MS – and four kids of her own. He said his sister just got on with it, and urged me to do it too if I wanted to. It was what I needed to hear. Obviously Ian and I were worried how I’d cope physically but we decided we’d manage come what may. After all, why should I let my condition stand in the way of our dream? Having decided to go for it, we were happy when we found out I was expecting again. I was lucky throughout the pregnancy – despite feeling a lot more tired than I’d been the first time around. When the baby was due, I opted for an elective Caesarian section because I couldn’t have managed a full labour. But not long after my daughter, Gracie-Mae, was born in 2011 I had a 10-day-long ‘MS hug’. It sounds lovely but it was a relapse that felt like having a snake wrapped round my middle, squeezing me tight. Four years on, and baby Gracie-Mae is at nursery while her brother Ollie is now at school. I feel fortunate that being a mum hasn’t worsened my MS, but daily life is still a challenge. I work part time and juggle childcare as any mum does, and my mum and mother-in-law do a lot to help. There’s still weakness in my left arm and left side, and every now and then I have to furniture-walk around the house. My main issue is tiredness, and it’s so overwhelming I have to stop and go to bed. Doing as much as possible as a family is important to me. If we’re going out for the day I’ll usually push myself, and then collapse afterwards. Recently Ian suggested taking Ollie and Gracie-Mae to the park – but I was too exhausted so had to sit in the car watching them play instead. I’d love to have kicked a football around and pushed them on the swings, but accept I have limitations. Not long after being diagnosed I found out about the Kent MS Therapy Centre – a 10-minute drive from home. I started having Oxygen Therapy, massage and reflexology – and quickly saw what a great source of support it could be. The centre’s helped put me in charge of my MS as it makes me feel I’m doing something constructive towards coping. And because I had another baby after being diagnosed, I’ve been able to help two other Kent MS Therapy Centre members who wanted to be mums. They were worried about how they’d cope, and how it would affect their MS.